For many years, we have opened our doors every weekday at 9:30 am for our drop-in service. However, we have made a few important changes recently in an effort to meet the needs of different members of our community with the resources we have. The biggest change is that on Wednesdays the drop-in will no longer operate in the morning, but will instead be a lunchtime service with doors opening at 12. 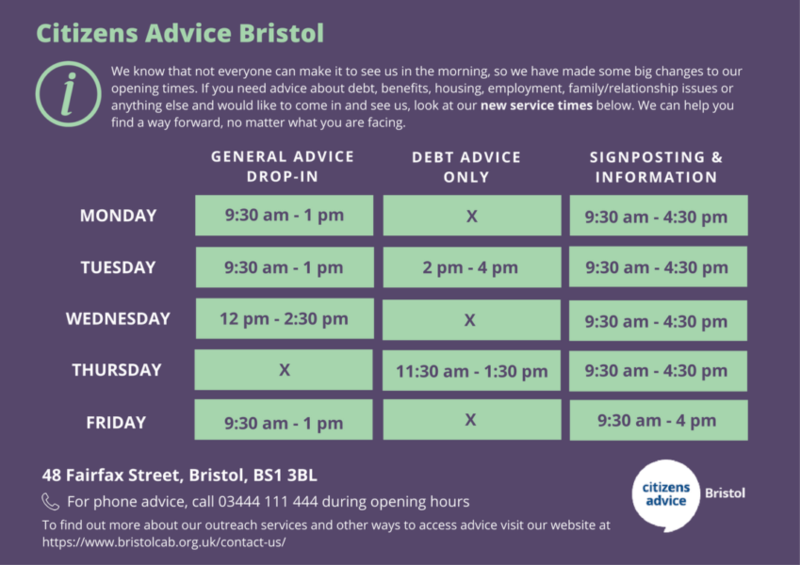 There will no longer be a general advice drop-in on Thursdays (though telephone advice will still be available). On Mondays. Wednesdays and Fridays our drop-in will run as normal with the doors opening at 9:30am. We will also have two debt advice only sessions: Tuesday, 2 pm – 4 pm and Thursday 11:30 am – 1:30 pm. This reorganisation of our service may take a little getting used to but we believe that it will provide a possible alternative for those who can not always make it at 9:30 am.